Several recent surveys of small business owners have found that finding qualified workers is one of the top challenges facing entrepreneurs. In times of growth, employee recruitment becomes even more of a concern. We are not just trying to fill new positions, but also replace openings created by employee turnover. Although it is usually easier and almost always less expensive to retain an existing employee rather than find a replacement, we often fail to take necessary steps to reduce employee turnover. Opportunity to advance as company grows. Growing companies can offer ample opportunities to promote existing employees. Make sure to not just offer the opportunity, but the training and development to make such advancement possible. Positive work environment. The positive culture of a small business is what draws many employees to work for you in the beginning. The stresses of growth can often change this part of the culture of a business. Take steps to maintain the culture you intended to create in the early days of the business. Achievement and personal satisfaction. Although these are intrinsic factors, they are related to how we design jobs. Keep these things in mind as jobs evolve as your business grows. Rewards. Although money is important, it is not the only reward we have to offer. Recognition, status, respect, inclusion, and so forth, are all important rewards to most employees. Community. 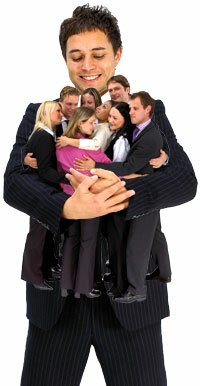 Many small businesses have a sense of “family” about them. Don’t underestimate the power of these bonds to retain employees. Clear vision that is openly shared. Keep employees informed of where you are headed, and remind them often. The chaos of growth can become overwhelming. Vision can help calm these feelings and help get everyone focused on the tasks at hand. I spent much of my time during our rapid growth traveling throughout our various locations communicating to our staff about our vision and why we needed to grow. Security of place in firm as it grows. Many employees leave because they are worried they will not fit in as the business expands. Provide career plans for each employee to help them understand their place in the firm. Opportunity for balance in their lives. Although growth may create the need for long hours from every employee from time to time, be sensitive to the strains this can create in employees home lives. Don’t take advantage of employees’ willingness to pitch in during busy times by making it a standard expectation of their jobs all the time. Posted in Employee Retention by vimonmass on September 19, 2014 .